The wonderful memorial events for Admiral Arthur Phillip in London, UK. On Tuesday 8th July the Hon Alexander Downer, High Commissioner for Australia, hosted a cocktail Party at Australia House. The High Commissioner greeted the guests, and the Governor Dame Marie Bashir spoke about her admiration of Arthur Phillip. Among the large throng of guests was Michael Pembroke, author of his excellent book on Phillip, Sailor, Mercenary, Governor, Spy, who is a descendant of two First Fleeters. On Wednesday 9th July about thirteen First Fleeters and more than forty Australians were among the 600-700 guests. The group was seated in the front row of the 1st section of the Westminster Abbey, just a few seats from the Duke of Edinburgh – in the area before the dividing arch leading to the altar. · His Royal Highness Prince Phillip, Patron of the Britain-Australia Society. · During the service the Governor spoke very movingly about Arthur Phillip. · Vice-Admiral Steel of the Royal Navy read from the Book of Isaiah. · Alexander Downer read from the Book of St Matthew. · Sir Christopher Benson, Chairman of the Britain-Australia Society, dedicated the Memorial Stone for Arthur Phillip. · Prince Philip laid a bright red wreath at the head of the memorial stone. Founding Father of the Australian Nation. Short prayers were delivered by Hon George Brandis (Aust. Minister for the Arts); the Attorney-General for England & Wales; Rev. Bush from London’s Church of St Mary-le-Bow; and Rev. Sempell, Rector of St James Church, Sydney. Accompanied by the Abbey’s majestic organ, the choir sang the hymns magnificently accompanied by strong voices of the guests. The Abbey bells rang out as we departed and the Australian flag was flying high in a strong breeze – spine tingling, unforgettable! This was a once-in-a-life-time occasion and feel very blessed to have taken part, executed in true British pomp, ceremony and style. Afterwards we were led into the private gardens of the Dean of Westminster for words of welcome and thanks for our support for these events. The Governor was interviewed by ABC24 in the garden - referring again to the sterling qualities of Phillip, his command of the First Fleet and governorship of the infant Colony. First Fleeters were standing close by talking to her husband, Sir Nicholas Shehadie, who accompanied the Governor in London and Bath. Many people continued on to Bath and Bathampton where Arthur Phillip spent his retirement, where again the memorial events were very successful. Extract from NSW Legislative Assembly Hansard and Papers Wednesday 10 September 2014. Mr JONATHAN O'DEA (Davidson) [1.21 p.m.]: On 28 August 2014, Minister Stokes and Her Excellency Professor the Honourable Dame Marie Bashir unveiled a bronze memorial bust of Governor Phillip at the Museum of Sydney to mark the bicentenary of his death on 31 August 1814. Captain Phillip commanded the fleet of 11 ships carrying more than 1,500 convicts, officers and marines that set sail from Portsmouth in 1787. He settled in Port Jackson, now known as Sydney Harbour, which he declared as "the finest harbour in the world". He became the first Governor of New South Wales and sought fairness and dignity for convicts and Indigenous people. After being speared at Manly Cove in 1790, Governor Phillip ensured that there would be no retaliation so that peace in the colony could be preserved. The development of modern Australia owes much to his remarkable leadership, vision and inspiration. Members of the Arthur Phillip Chapter of the Fellowship of First Fleeters reside on the northern side of Sydney. Recently 20 members attended the Wallabadah commemorative event at First Fleet Park, Tamworth. 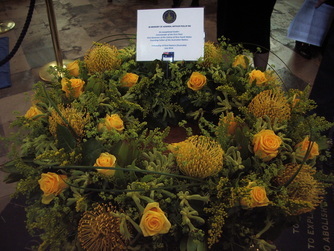 Members of the Fellowship of First Fleeters were invited to attend a commemorative service for Arthur Phillip at Westminster Abbey on 9 July this year where the Duke of Edinburgh laid a bright red wreath and Gillian Doyle of Pymble was honoured to assist in the laying of a green and gold wreath, representing Australia and the Fellowship.